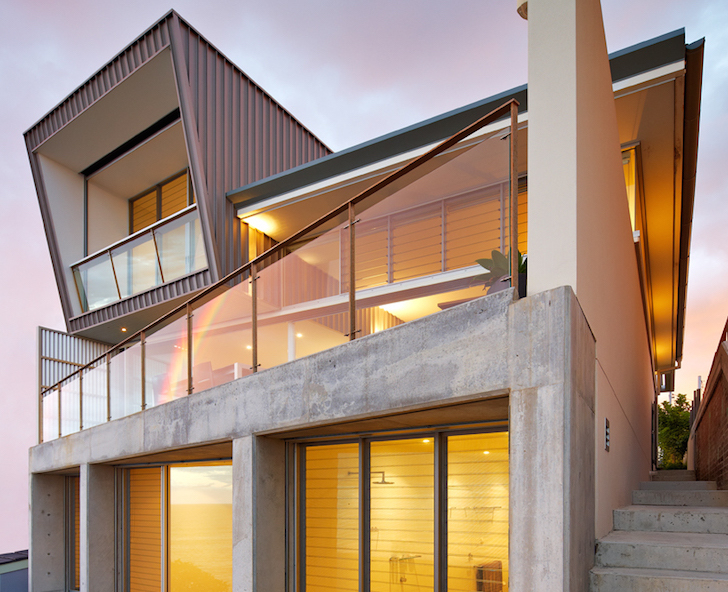 Australian firm Utz Sanby Architects completed the Queenscliff Home, an energy-efficient house that stores and recycles rainwater for non-potable uses. Located on a tight urban block in Sydney, the wedge-shaped home is perched on the edge of a cliff overlooking breathtaking ocean views. The architects’ strategic placement of structural walls and glazing maximizes natural light and views, while maintaining privacy. Closely sandwiched between neighboring buildings on the east and west sides, the Queenscliff House uses large fin walls to provide privacy for the upper level bedroom wing. The wedge-shaped home widens at the rear of the home, which creates the opportunity for greater panoramic views of the ocean. 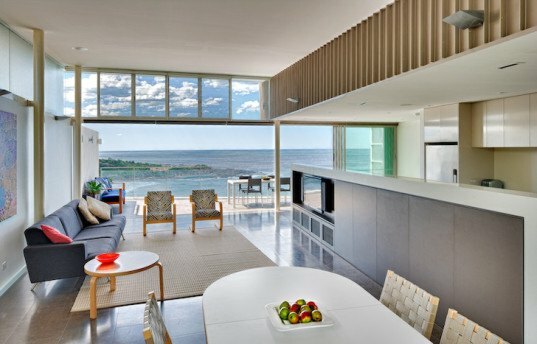 Large floor-to-ceiling glazing creates a continuous sense of space that extends from the garden and living areas out towards the deck and ocean. Utz Sanby Architects installed concrete floors, dark floor tiles, and masonry walls on the ground level to provide thermal mass. The thermally efficient home is warmed during the winter months through hydronic under-floor heating. Sub-floor rainwater tanks with a capacity of over 5,000 liters store rooftop runoff used for flushing toilets, watering the garden, and washing clothes. Closely sandwiched between neighboring buildings on the east and west sides, the Queenscliff House uses large fin walls to provide privacy for the upper level bedroom wing. Large floor-to-ceiling glazing creates a continuous sense of space that extends from the garden and living areas out towards the deck and ocean. Utz Sanby Architects installed concrete floors, dark floor tiles, and masonry walls on the ground level to provide thermal mass. The thermally efficient home is warmed during the winter months through hydronic under-floor heating. Sub-floor rainwater tanks with a capacity of over 5,000 liters store rooftop runoff used for flushing toilets, watering the garden, and washing clothes.